Combine all the basting sauce ingredients and soak the venison slices in the sauce for at least 24 hours. Pour off and reserve the sauce. Put the meat on a board and pat it dry, then nick the edges of the slices and rub them all over with the fat. 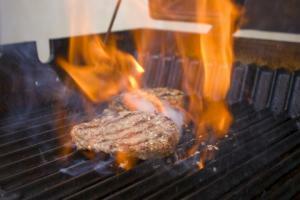 Heat the grill to medium-high and grill the steaks until medium-rare. Baste the meat with the reserved basting sauce while cooking and turn it once. In a small sauce pan heat remaining sauce to a boil. When done, transfer the slices to a warmed serving platter, and serve at once, with the remaining sauce in a sauce boat.